Streaks smoothed appearance of dehydration. 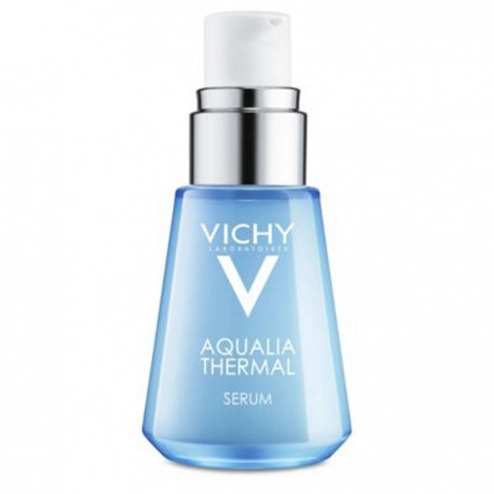 Vichy Aqualia Thermal Serum Powerful 30 ml with fresh texture has been specially designed to stimulate the circulation of water in all areas of the face to moisturize all skin types. Rich in thermal water known for its soothing and anti-irritating properties, this serum also contains hyaluronic acid and Aquabioryl that will bring the skin the necessary hydration and restore the skin's barrier function. The skin is saturated with water, the complexion is fresh and radiant and dehydration ridges are smoothed. Apply morning and evening before your usual cream. Formula INCI: Aqua, Glycerin, Dimethicone, Peg / PPG / Polybutylene glycol-8/5/3 Glycerin, Peg-60 Hydrogenated Castor Oil, Dimethiconol, Sodium Hyaluronate, Phenoxyehtanol, Chondrus Crispus (Carrageenan) Ammonium Polyacryldimethyltauramide, poloxamer 338, Disodium EDTA, Caprylyl Glycol, Citric Acid, Biosaccharide Gum-1, Acrylates / C10-30 Alkyl acrylate Crosspolymer, Perfume.